Louis Piérard, Brussels, a gift from the artist in 1932, and thence by descent to the present owners. The Comité Magritte has kindly confirmed the authenticity of this work. The present work, recently discovered, made a tremendous impact on the artist's oeuvre. It predates by one year the celebrated oil of the same composition and same title that Magritte painted in 1933, and that is a pivotal idea in his whole oeuvre. This work on paper is therefore the first time that Magritte displayed the idea of Les affinités électives - the egg in a cage. The concept of Les affinités électives (Elective Affinities) is one that Magritte considered his 'point of departure'. Its bringing together into a surprising unity of two disparate but not wholly unconnected images points to a hidden affinity between things that struck Magritte as a revelation. From this point onwards, it completely transformed his way of working. Up until he created this image, Magritte, like most other Surrealist artists, had always sought to expose a sense of the surreal by using a combination of the bizarre and the unfamiliar. Following De Chirico's metaphysical approach, he sought to create a poetic sense of the unreal by creating visual connections between things that seemed to have no connection with one another. After the creation of this image, however, Magritte adopted a wholly conscious method of investigation in his art, that explored the surprising hidden world of the everyday object which the hidden affinity between the egg and the cage had revealed to him. Appropriately, for a Surrealist, the revelation that led to the creation of this remarkable image came to Magritte in a dreamlike way in the moment just after waking. 'One night I awoke in a room where a cage with a sleeping bird had been placed', he recalled. 'A magnificent error caused me to see that the bird had disappeared from the cage and had been replaced by an egg. I then grasped an astounding poetic secret for the shock I felt had been caused precisely by the affinity of the two objects; the cage and the egg'. Whereas previously this shock had been caused by making objects with no relationship meet one another'. In retrospect, this revelatory moment can be seen as the culmination of an element in Magritte's art that had been building for sometime and was clearly and succinctly expressed in the conjunction of the cage and the egg. The bird is a symbol that obsessed Magritte all his life, but throughout the 1920s his art had often been populated by birds escaping confinement or capture. The egg in the cage combines the two elements of capture and escape in one image. 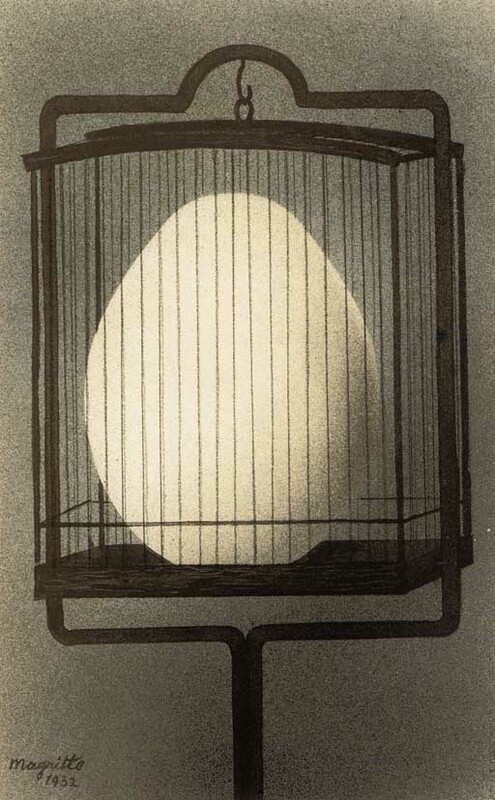 The cage is an image of confinement, but the egg is an image of possibility, of hope and ultimately, as Les affinités électives proved to be for Magritte, of a new beginning.